Holiday traditions...we all have them in some way. For some it means getting up early and driving for hours to cut down their own tree. For us, we were just happy hopping into the car and heading to Stew Leonard's to pick out the perfect tree. This year it was a tree lot along Pacific Coast Highway just as the sun began to set. Another family tradition was dinner at Union Square Cafe in NYC sometime during the holidays. We were never organized enough to make reservations so that meant arriving at 5:30 just as they opened their doors and grabbing four seats at the bar. We have so many fond memories of dinners in the city...just the four of us. So this year I made Union Square Cafe's Bar nuts to reminisce about the past while we make a few new traditions to carry on in the years ahead. Toss the nuts in a large bowl to combine and spread them out on a baking sheet. Toast in the oven until light golden brown, about 8 minutes. Thoroughly toss the toasted nuts in the spiced butter and serve warm. Yum! To send to out of town friends, I put the dry ingredients into the small jars and nuts into bags. All they have to do is pour the nuts onto a baking sheet and toast. Add melted butter with the ingredients in the jar and mix all together, serve warm... and enjoy! These sound delicious and of course I love your packaging! What a special treat for your far away friends. Now, that is a gift anyone would love to receive. The bowls make it. Thank you for sharing. Merry Christmas to you and yours. We do so agree with you about the happiness which all of these traditional activities give. And it is often the simplest of them which prove to be the most pleasurable. Oh I want those bowls, I bet they're not available over here, I only seem to want US goods! I am a spiced nut, nut. 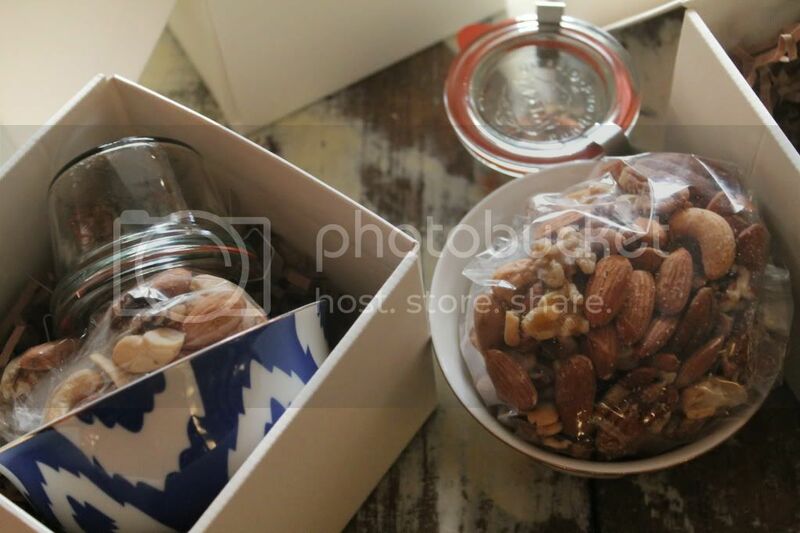 You did a great job packaging your nuts, I really do think the packaging can be half the fun of receiving a homemade food gift. 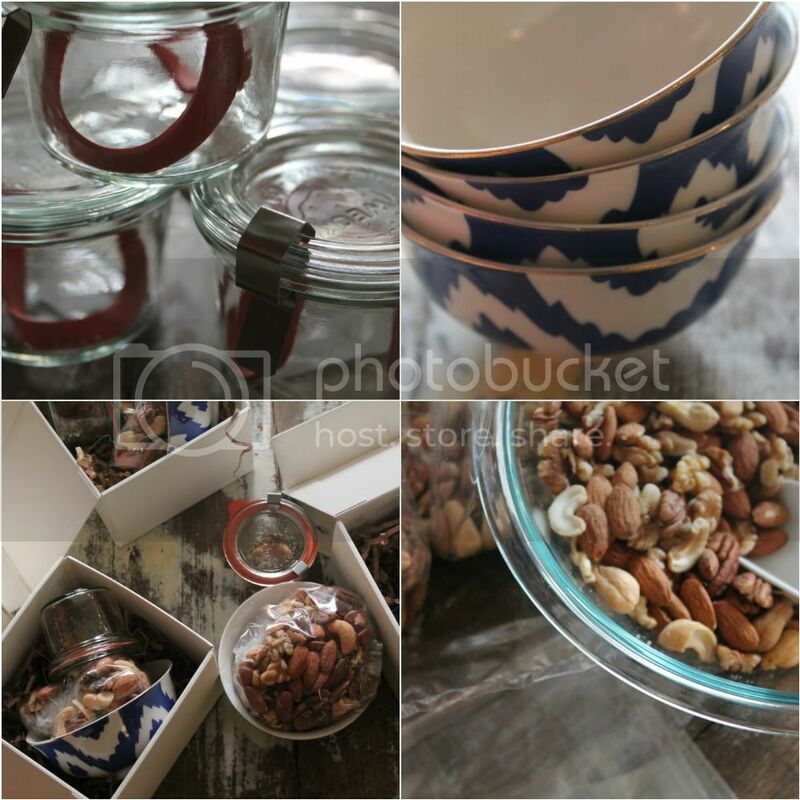 The lovely blue nut dishes are a wonderful addition to your mix! "YUM" is right!! I love the bowls, the recipe, which I will make this week and your simple wrappings make it all come together so beautifully. What a great idea!!! I love the packaging you used. I will be trying these - and heading to Union Square Cafe the next time we are in NYC!! I recently discovered your blog through Paula at Twoellie. I love your idea of sending this to out of town friends. Your packaging is delightful and they will have the bowl long after the treat is gone. Merry Christmas! We sat next to Sarah Jessica Parker the last time we ate at the Union Square Cafe. That place never disappoints. I love how you go out as a family...such a sweet (I should say savory) present!!! Yummy, love this idea! Union Square Cafe is delish, I have only been once but loved it, thanks for sharing! I love this idea so much, Annie! I have got to make those nuts. They sound divine. Lucky, lucky friends who you send them to. I'm sure they appreciate it so much. Tomorrow I'm posting my holiday baking. Can you say sugar overload?! These look wonderful! Love the ikat bowls especially. Great idea. It's a Lovely Thing! The nut mix looks delicious! I am awarding you the 'Liebster Blog' award. Congrats! Read more about it on my blog. hi Annie! I have made these before, and they are fabulous and addictive!! What a wonderful tradition. How exciting that you are moving back CT and next year you can plan dinner at Union Square Cafe again! Do you think they'd take a reservation a year in advance?!! I live in NYC (Union Square to be exact), and USC is my neighborhood spot! In fact, my boyfriend and I are going there tonight to celebrate Christmas! We'll sit at the bar for glasses of prosecco and bowls of their delicious black bean soup, and then head in to the dining room for Tuna Burgers and Lobster Pot Pie. That place is my heaven on earth! Thanks for the idea Annie! Glad to see I'm not the only one whose traditions get "changed" from time to time. Love the bowls. I am going to try the nuts tonight. They look delicious. 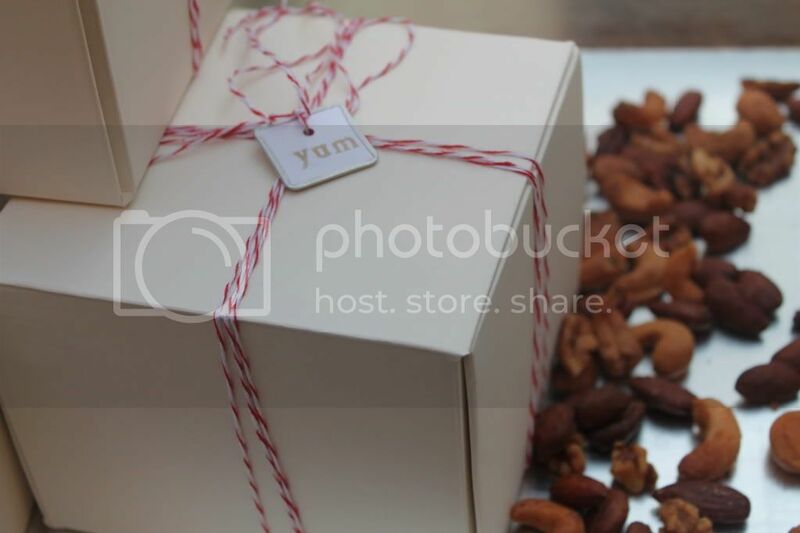 Thanks for sharing your yummy & pretty gift idea, it's perfect for neighbors! Going in my file for next year! Merry Christmas!